Donna Frisby-Greenwood began her career in 1988 as an urban 4-H extension agent with The Penn State Cooperative Extension in Philadelphia. 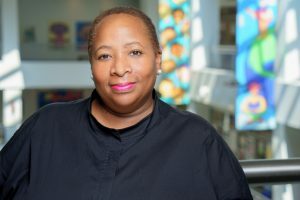 In 1990 she co-founded and served as Executive Director of Children First, Inc., a leadership development and civic education program for low income urban adolescents. In 1994 she became a Special Assistant to HUD’s Assistant Secretary for Policy and Research as a National Urban Fellow. Subsequent positions have included Executive Director of Rock the Vote and Executive Director of the After-School All-Stars Philadelphia. Donna Frisby-Greenwood is a graduate of the University of Virginia and holds a Masters of Public of Administration from Baruch College/CUNY.